Red Cedar Patio - Why build a patio out of cedar wood? Red Cedar Patio - Why build a patio out of cedar wood? home › blog › Wood › Western red cedar › Red Cedar Patio – Why build a patio out of cedar wood? Red cedar has been used for generations in the construction of shingles for houses, furniture and wood patios. My great-great-grandfather built his career around cedar, building furniture and fabricating wood shingles. My mother and grandmother both had one of those famous cedar chests. If we stop and think about it, why is cedar is so popular? First, red cedar is a superb wood, and a red cedar patio will certainly have a remarkable esthetic quality. The grain is straight and uniform and is easily stained. Your red cedar patio can easily match with your home. 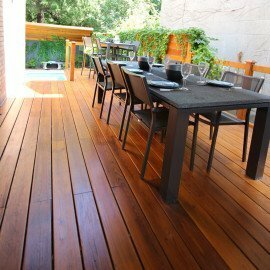 However, what makes red cedar popular in the construction of wood patios is its durability. A red cedar patio will be more resistant to insects, mushrooms and humidity than a patio made out of treated wood. This resistance is based on several factors. The humidity content of red cedar is less than that of pressure-treated wood. We estimate it at between 18 and 23%, rather than 25 to 30% in treated wood. Concretely, this means that the railings, posts and floors of your red cedar patio will be less prone to fissures caused by rapid drying in the sun. Additionally, red cedar naturally contains in its sap components that fight mushrooms, preventing them from taking up residence and damaging your wood patio. These same components also fight against insects, such as termites, making the wood less welcoming to them. Another advantage of a red cedar patio is that the wood is naturally stable and remains flat, and will not deform or crack as easily as treated wood. A red cedar patio will be resistant to weather conditions and insects even without treatment. On the other hand, be aware that the sun will cause graying starting two or three years after construction. However, allowing red cedar patios and fences to naturally gray is a common trend today. If you do not like gray, you’ll have to apply a finishing treatment. If you like the texture of the wood of your red cedar patio, opt for a transparent or semi-transparent stain. Keep in mind however that a transparent type finishing does not protect well against the sun’s ultraviolet rays, and your cedar patio will require frequent treatments. Semi-transparent stains offer a bit more protection and require less frequent treatments. Varnishes and lacquers are not recommended for use on cedar, as they will peel. Choosing an opaque finish offers the best protection against the sun’s rays, but this type of finish has the disadvantage of hiding the natural beauty of red cedar wood. Whether without finish, with a natural transparent or semi-transparent finish, or an opaque finish, your red cedar patio will provide years of pleasure.